India and Russia are planning to sign their biggest ever Defence deal expected to be worth over USD 30 Billion for the fifth generation fighter aircraft (FGFA), whose first prototype would be brought to India in 2014. The initial version of a fighter plane, being jointly developed by India and Russia and tipped to be one of the most-advanced in the world, will be unveiled in India in 2014. 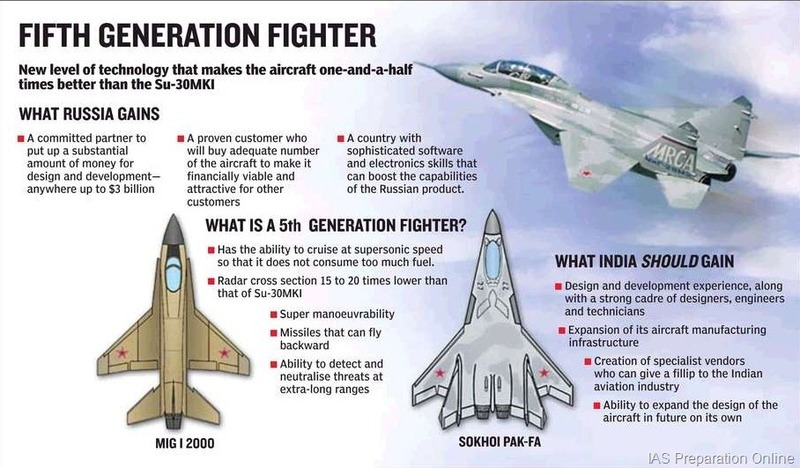 The Fifth Generation Fighter Aircraft (FGFA) with stealth features is slated to be inducted in the Indian Air Force by 2022. The two sides are close to signing a key contract expected to be worth over USD 11 billion for research and development phase of the project in the near future. The second prototype will arrive in India in 2017 and the third prototype will arrive in 2019. Based on the experience of test-flights of the each prototype, the final version of the FGFA would be developed for operational service. India plans to acquire 214 of these fighter planes by the end of 2030 at an estimated cost of over USD 30 billion. Russia has already developed three prototypes of the aircraft which are being used for carrying out test-flights. The aircraft will have stealth features and its size would be smaller than that of the frontline Su-30 MKI.